15 minutes to the ocean! Our area has much to see & do! Come have fun! Camelot has a variety of activities so you can meet new friends. Whether you want to relax or be busy-it's here! Come enjoy your stay at Camelot! If you can get past the train noise and the traffic noise from the hwy this is a very nice place to stay. We have a small trailer so we rely on the shower facilities and were not disappointed here. Heat lamps, yes please and thank you! It was a cold spell some mornings so we enjoyed this feature. Laundry was convenient as well. We enjoyed driving to Sebastian, which was about 15 minutes south. Lots of restaurants and things to do there. About 20 minutes south gets you to the ocean beaches. I enjoyed our 3 weeks here. And we actually got used to all the train whistles and road noise after a week or so. Love the 55+ environment. Friendly people and quiet....well except for the trains. Stayed overnight. The pull thru sites were very tight and open to a common area where many people parked vehicles. Several had to move so we could exit. Other sites were more spacious. Good location to visit the beaches or space coast. Nice staff. Great staff! 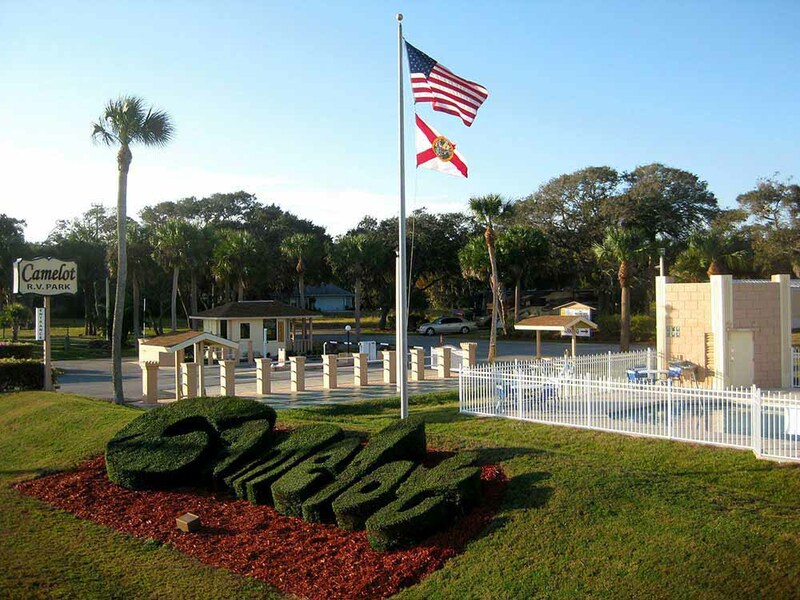 Well-maintained, security-gated 55+ resort with many fun activities. Very clean bathhouses and laundry facilities. Dog-friendly. Although many of the sites are smaller, they are very adequate for extended stays. Off Rt1 on the Indian River and close to all Space Coast attractions, Melbourne, and a variety of beaches. Have stayed here twice now and it is consistently great! Will be back. A lovely park, not far from the coastline. The hosts were very welcoming. The rec hall/games room was spacious and well-equipped. Our pull-through site was in the center of the park, but was a little narrow and barely long enough, but not all the sites were. Very nice pool and deck area. They had lots of planned activities to choose from. Shopping and outlets were not far. Price was very reasonable. Very helpful, friendly staff, nice location, big sites.